Kit has a copyright date of 1989. I paid $12.50 for my kit back then. The kit is available in the 2013 re-boxing at 2 locations overseas. The smallest and fastest operational Royal Navy craft during WWII, the motor torpedo boat with the advantage of shallow draught and speed contributed greatly to the successes attributed to the Navy for enemy ships sunk from 1939 to 1945. By the end of the war, a fleet of more than 1,500 small boats was operated under the British flag. 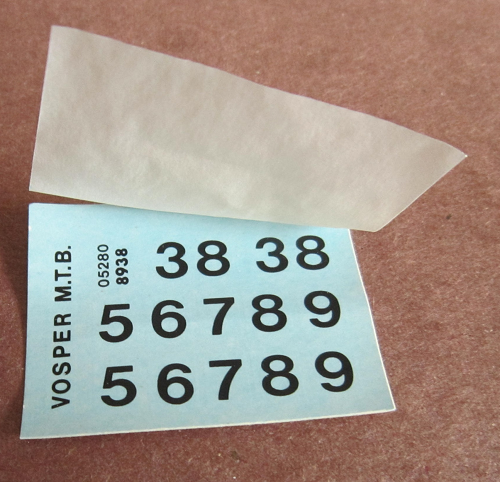 This kit represents a Vosper 73 ft. (third series) MTB which was developed from the company's earlier 70 ft. (first series) and 72 1/2 ft. (second series) boats and differed externally in having four 18 in. torpedo tubes on a flush deck as opposed to the earlier two-tube boats. This third series 73 ft. craft entered service in 1944. Methods of torpedo attack varied with circumstances. Darkness was preferred and due to the fluorescent nature of the wake created at speed MTB's usually lay in wait, with engines stopped, in the path of a convoy. Then, with silent running on the auxiliary engines, launched their torpedoes. Crash started the main engines and retired before a counterattack could be mounted. Mine laying was another task of the MTB, while a further duty was the delivery and collection of secret agents and commandos on the enemy-occupied coasts. In the seas around Britain a total of 269 ships were sunk for the loss of 76 of this type of vessel. A crew of 13 was carried and three Packard engines of 3,600/4,050 B.h.p. gave a speed of 34 to 40 knots. Armament comprised one twin 20 mm cannon forward, two 5 in. guns and two twin .303 machine guns. Length was 73 ft. and beam 19 ft.
Humbrol/Airfix was an old prolific model company based in the UK. They produced all manner of model subjects in the popular scales. I believe they have gone out of business. 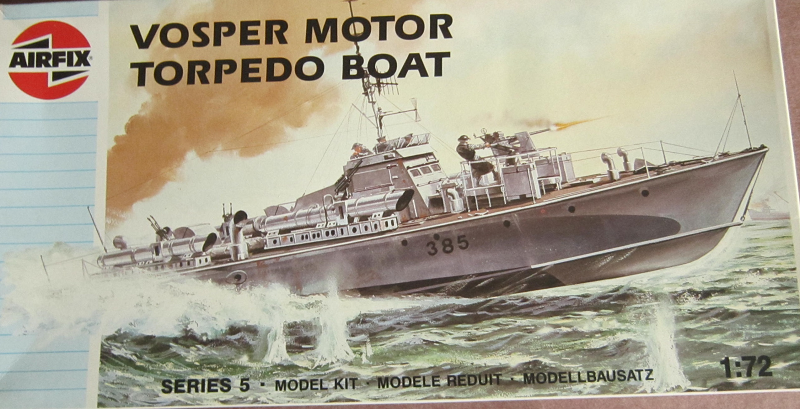 The box art shows a Vosper cruising along. A crewman is manning the forward twin 20 mm cannon. The boat is in shades of gray with a black bottom of the hull. It has the black number 385 on the sides of the hull. One side panel has Humbrol/Airfix's address in the UK provided and a small color repeat of the box art. 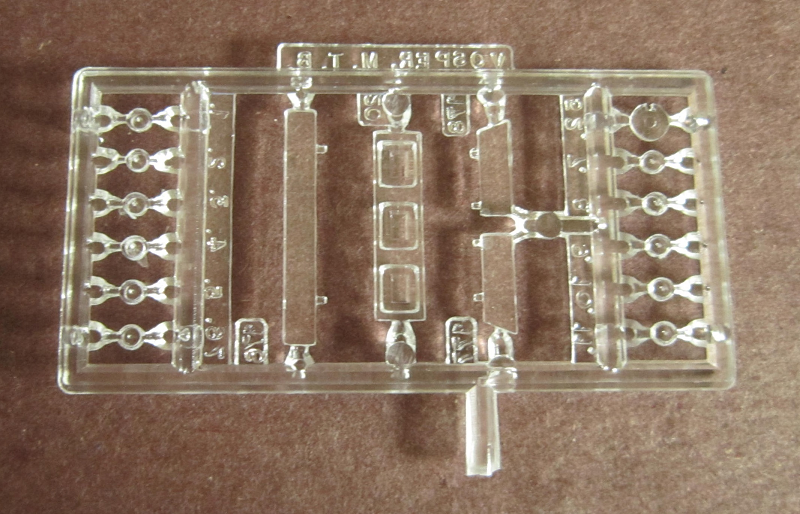 The other side panel says the kit is not suitable for children under 3 years of age and is designed for modelers over the age of 8. Paint and glue are not included. The model makes up to be 170 mm high ( 7") and 305 mm long (12"). The kit contains 4 medium-gray trees, a medium-gray deck, hull bottom and sides, a clear tree, a sheet of flags and pennants, the decal sheet and the instructions. The instructions consist of a single sheet that is printed on both sides in in 11 34" x 16 1/2" format. The face side holds 7 assembly steps. The reverse side gives the remainder of a total of 11 assembly steps, above the painting instructions with 2 illustrations of the boat. Colors called out are: light-gray, bronze, sea-gray, black and white. There is a black number 38 on the sides of the hull. You are supposed to add a third number behind the 8 of either 5, 6, 7, 8 or 9. To the right there is the history of the Vosper in English, French and German, over general instructions in 12 languages, including English and international assembly symbol explanations in 9 languages. Trees are not alphabetized or illustrated in the instructions. They do have part number tabs next to the parts on the trees. However, these are tiny and rather hard to read. ​Next is the loose medium-gray hull bottom, sides and deck. ​The decal sheet is next. It just holds black numbers. It has a tissue on its face to protect it from scratching. 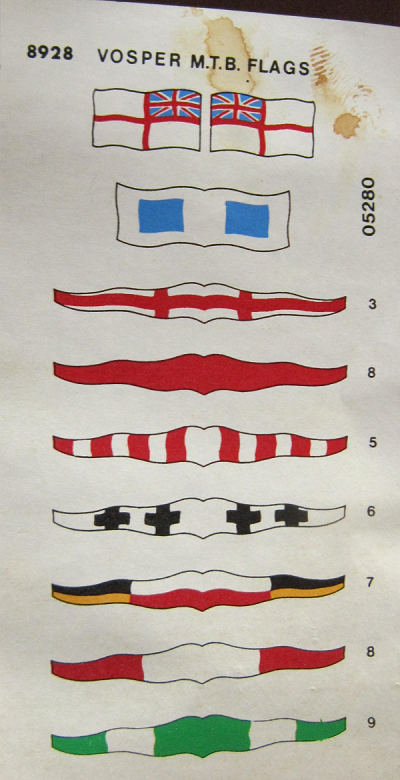 ​There is a sheet of pennants and flags that you are supposed to cut out with a scissors. ​This kit is very nicely detailed.